The source files to be able to make Piccolo are available over on Github and the design uses off-the-shelf hardware together with the Arduino platform. Piccolo is capable of using either a brush or pen and can be seen in action in the video below. The Piccolo uses Arduino and can be powered by either USB or an external 5V supply depending on your needs and can either use a Piccolo PCB, or another Arduino compatible development board. 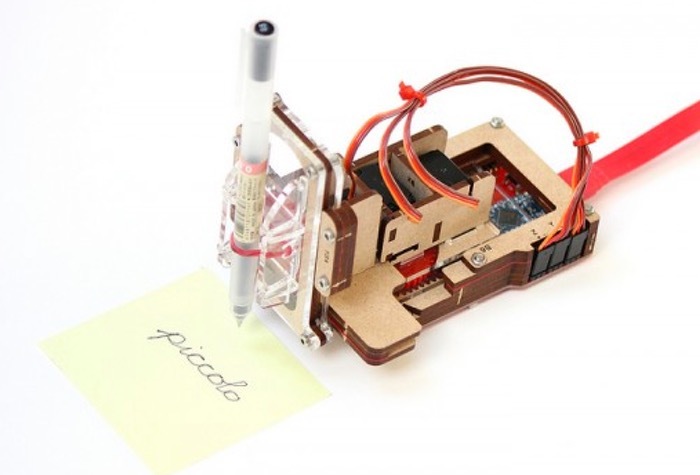 For full details of all the parts you will require to build your very own Piccolo drawing robot together with the laser cutting diagrams, which could I guess also be 3D printed if a laser cutter is not available. Assembly instructions are also included and its creators say it will take around 2 hours to construct.